Rhin-O-Tuff Onyx OD4012, the premium efficient open-ended punch machine. 11 inch, A4 size, dies with the open sides design for wider sheet punch freedom. The OD4012 features a user friend and easy "Paper to Pin" construction, creating a well-balanced hole to edge margins, perfecting even on odd-sized documents. With an Incredible punching power capacity of up to 30 sheets of 20 lb paper, 60 pages can be punched at one time with perfect and align holes. Hate the process of changing dies? No problem, so do we. With the Rhin-O-Tuff OD4012, complicated die changing process are over. 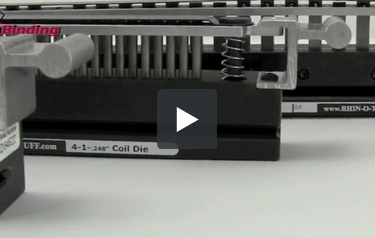 The swing away die pin retainer system allows for a quick and fast access to all die punch pins. It's as easy as 1-2-3 with the capability to secure the punch pins firmly. 12 standard interchangeable die patterns offer a wide variety of punch styles. Manual and auto-reversing structures eliminating the word "jam" out of this system. The punching capacity of this machine varies depending on the die set selected. Great Production Machine, easy to operate. So far so good Review by Celeste E.
I've just been using the product for a couple of weeks but it seems to be a good product. I am wondering about the 30 sheet capacity, though. I punched a 13 page document and it was tight. I doubt that it will punch 30 pages at a time. Welcome to MyBinding video. Let's have a look at the all-new Rhin-O-Tuff Onyx OD4012, an 11-inch open-ended punch. In this video, we'll open the box, take the machine out, set it up, and give you an orientation. All Rhin-O-Tuff Onyx punches are very heavy, so get some help to pull it out of the box. Remove this tape that protects the clear cover to the chip tray. The main box contains two other boxes; the larger of the two contains the die that came with your machine. Open it up and slide it into the machine. You do so here on the left-hand side, sliding it all the way flush and locking it down. The second box contains the foot pedal, the power cord, some oil, and a manual reverse knob. The power cord and the foot pedal plug into the back of the machine. At this point, you're ready for your first project. On the front of the machine is the paper stop, or side margin control knob. This you lock into place so that all punches are consistent throughout your entire project. Place some scrap paper down into the throat of the machine, press the foot pedal, let's see how it looks. For great binding, the holes should line up and be centered. A great test is to fold the paper over corner to corner and see if in fact the holes do line up. Before making any adjustments to the die to correct errors, turn the machine off. Loosen the screws on the front and remove the die. Since all Rhin-O-Tuff die pins are disengageable, you can do so by depressing the pin carriage, removing the pin capture, and now line up the paper along the die to see which one to remove. And simply pull it up and out, any and all. Replace the pin capture, and load the die back into your Onyx OD4012 and lock it down. Give it another punch, another test, and you're all set to go. Now you're set to punch through your book and then bind it. Within the Onyx series, there's a number of different options for binding. For speed and space efficiency, many of them will fit right on top of the Onyx OD4012, making it easy to finish your project one step right after the other. All Rhin-O-Tuff Onyx punches come with a patented auto-reverse feature. As you work, features inside the machine keep it from jamming. However, there may be a situation where you need to turn the machine off and reverse it manually, using this knob. Remove this little cap from the left side of the machine and place the knob inside that hole. It fits right on the threads and the, by turning it counter clockwise, will reverse the pins, bring them back into the machine, and you can pull out your paper. And that is the Rhin-O-Tuff Onyx OD4012. For more demos, reviews, and how-tos, check out MyBinding.com. Welcome to MyBinding How-To videos. 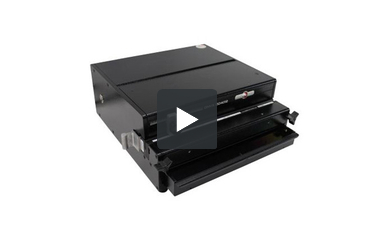 This video shows just how easy it is to change a punch die on a Rhin-O-Tuff Onyx OD4012 punch. First things first, make sure the power is turned off in the back. And then loosen both knobs on the front of the machine at the same rate. You do not need to remove the two knobs from the machine, just loosen enough to pull the die out easily from the left-hand side. At this point you can remove any pins you need for your project or switch the die out all together. Rhin-O-Tuff’s interchangeable die system allows all these different dies to work exactly the same way and fit in the same slot. Slide it all the way back in so the black part is flush with the side of the machine, clamp down the two knobs, and you’re all set to go. That’s it, that’s easy die changing on the Onyx OD4012. For more demos, reviews, and how-tos, check out MyBinding.com. Welcome to MyBinding video. This video looks at the features and uniqueness of the Onyx OD4012, a heavy duty punch by Rhin-O-Tuff. Backed by a full three-year warranty, this is a solid machine. Able to handle the most extreme of workloads, this machine will not let you down. The paper stop is solid, it's not going to fall apart, and it's going to hold for great consistency through all your projects. The Rhin-O-Tuff interchangeable die system is at full affect here; Rhin-O-Tuff has created so many different dies for different needs, this one machine can be use for all of your punching projects. The dies themselves slip in and out and all work the same way. And depending upon the needs and the sizes of your projects, all the pins are disengageable in every punch die. It comes standard with a foot pedal, making hands-free punching possible. 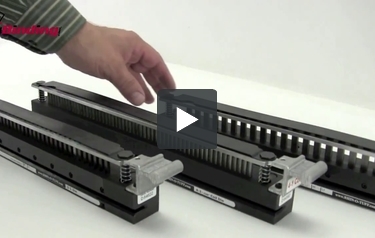 The Rhin-O-Tuff Onyx series includes numerous module units designed for binding or speeding up the whole process. And for efficiency of space, the Onyx OD4012 is big enough for them to sit on or be bolted to. That's the Rhin-O-Tuff Onyx OD4012. For more demos, reviews, and how-tos, check out MyBinding.com. A binding punch is a must-have device if you're interested in any of today's most popular document finishing methods (i.e. plastic comb, wire). If you are, you'll want a device such as the Rhin-O-Tuff OD4012. Here's a rundown on this machine, as well as what it gets on a scale of 1 to 10. There are 12 modular, interchangeable die sets available for the OD4012. They can be used for various binding methods such as plastic comb, Velobind, color coil, and more. There's also a 3-hole die set so you can prepare your documents for storage in binders. The punching capacity of this device will vary somewhat depending on what die set you're using. However it has the ability to punch up to 25 sheets of paper at once. While this isn't on par with the the Rhin-O-Tuff HD7000 and HD770 punching capacities (they can punch upwards of 50 sheets at once), it's still a respectable amount. Plus, this device can do up to 60 punching cycles per minute, which is pretty good. The die sets are really easy to change because you don't need to use any tools. It takes only a minute or two to change them out, so you'll be able to switch between binding methods quickly. The OD4012 has a punching throat that's 12 inches wide. It's perfect for paper that's up to 11 inches long, such as letter-sized (8.5” x 11”). Since the throat is open, it's possible to punch longer paper, especially since the dies have open sides. However, you may find punching longer paper to be a bit challenging. This machine has a chip tray that allows you see how full it is getting without emptying it. The tray will hold a lot of chips before you need to empty it. The OD4012 offers both easy and quiet operation. It's quiet enough so it won't disturb everyone around you so productivity can stay up. And it's easy to use thanks to a foot pedal and on-demand operation. This device is very versatile. If you have any OD4000 or OD4800 dies you can use them with the OD4012. The same goes for any HD modules you may have on-hand. You can attach them right to the machine. Paper jams won't be a concern because this device has both a manual and automatic reverse that helps you remove any extra paper. Like most of Rhin-O-Tuff's machines, the OD4012 is solidly built and has been entirely built out of metal parts. It also comes with a one-year warranty so you can get repairs done if necessary. On a scale of 1 to 10 this machine gets a . . . 9. The Rhin-O-Tuff OD4012 is definitely a solid entry in its lineup of modular binding punches. It has a some really great features such as the interchangeable dies, the large chip tray, and its ability to operate quietly. Punching documents longer than 11 inches will be challenging, but you should be able to get the hang of it. Since this machine has so much to offer, check it out today.